I might get corrected with the title of this article, but from my understanding of what a marlinspike is supposed to be, this fits the bill (in some ways). As you might have guessed, I debated on what to title this article because it might also be called a fid. For lack of a better term, I am going to call them "knot working tools" for the remainder of this article. If you are just beginning your journey into tying knots then you may not know what purpose these tools serve. 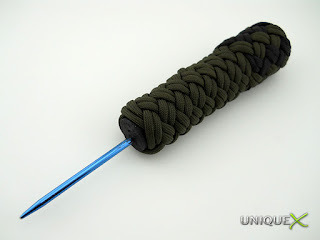 I use one of these almost every time I tie a knot to get the proper tension. 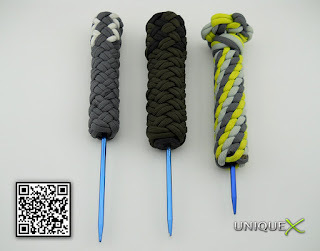 These can be made from different materials, but I chose a ready-made tool that only needs a handle to be a perfect knot working tool. To make a knot working tool you will need a Knitting Needle (I used a 14" size 5) that can be purchased from your local Wal-Mart, and a wooden dowel in the diameter of your choice (notice in the photos that I used two different sizes). 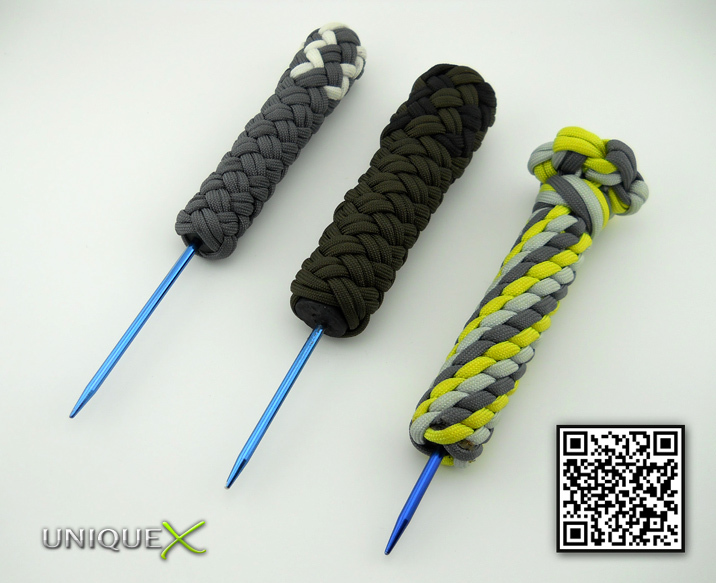 Once you have the required tools, you will want to decide on how long you want the knitting needle and wooden dowel handle to be. Once you decide, cut the wooden dowel with a handsaw or whatever tool you have available for wood cutting (I chose to make the handles longer because my hands aren't tiny and I find I can get a better grip with a larger handle). 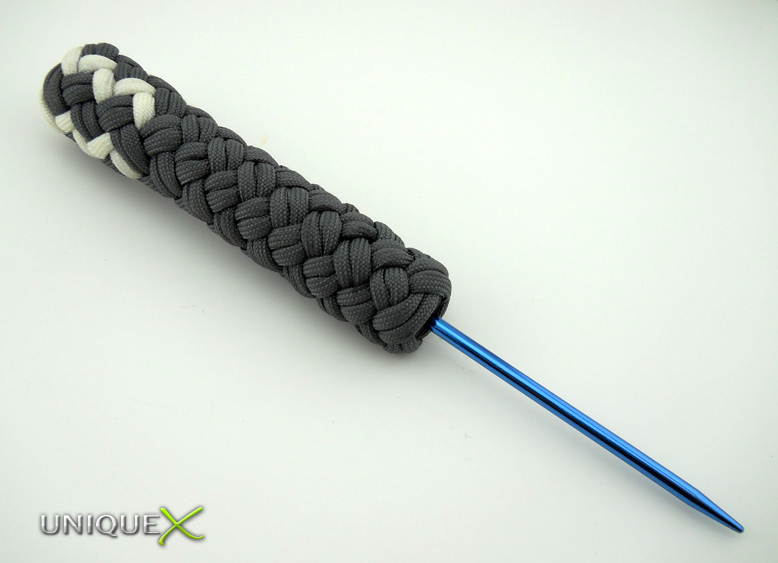 To cut the knitting needle to length, you will need to remove the metal cap over the end of the needle. I removed the cap by placing the needle in a vise and then I used a set of wire pliers and a hammer. Once you have the metal cap removed, cut the needle to length (remember that the needle will be inserted into the wooden dowel so you will need to estimate the handle size and the needle size) with a hacksaw. 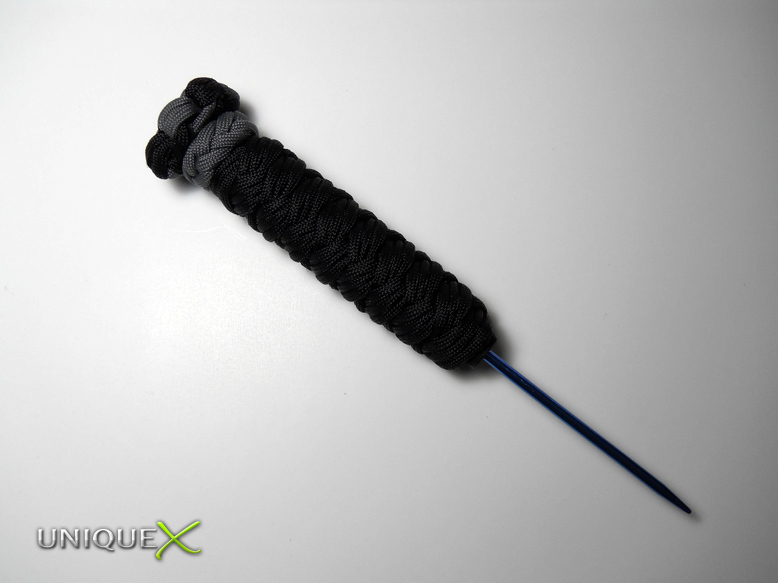 With the knitting needle still in the vise, hammer the metal cap back on the end of the needle. The next part is tricky if you don't have a drill press, but don't let that stop you because I didn't have one either. You will need a drill and the longest drill bit that you can find that is the diameter of the knitting needle or just a fraction larger. Drill down the vertical center of the wooden dowel, making sure you hold the drill as straight as possible. 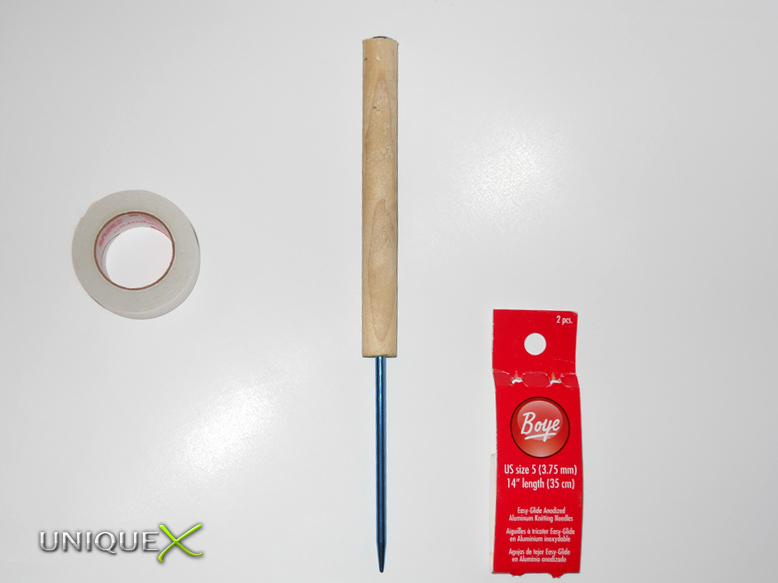 Once you have drilled the hole, insert the knitting needle through the wooden dowel (a hammer might be needed to get the needle through the dowel). Once you have put the materials together, you should have a fully functioning knot working tool minus the decorative paracord wrap. 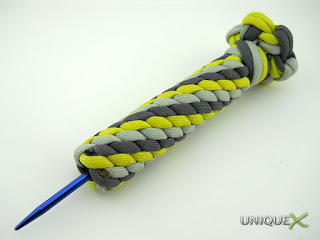 For the last part of the equation, you will need to choose how you want to wrap your new knot working tool. 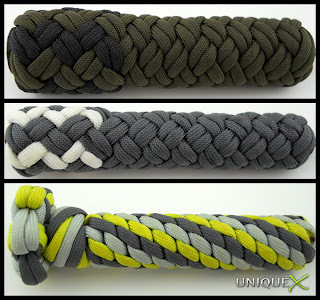 In this article, I chose to include four of my favorite knot working tools, from which you might decide to use one of the designs (or you can pick your own design). 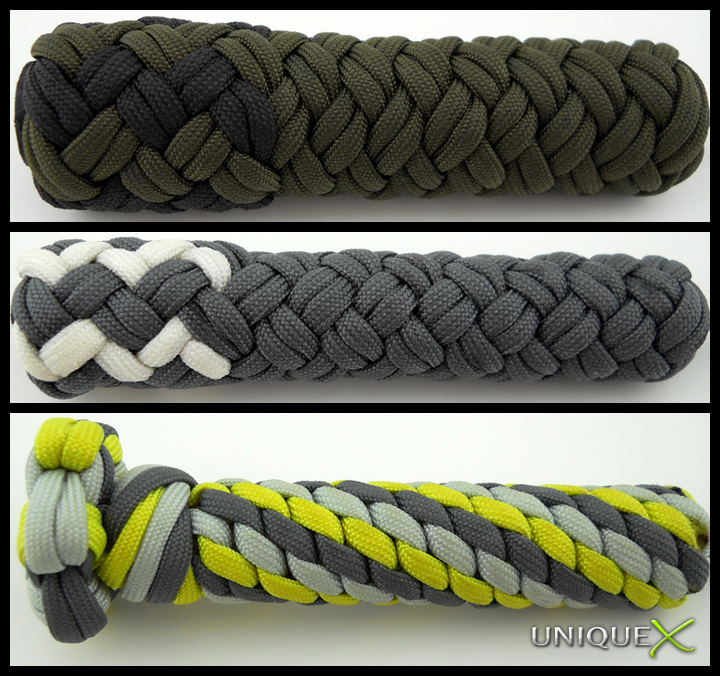 Whatever path you choose to take is completely up to you and needs to be a design that you really like because you will see it every time you tension or dress your other knot designs. If you want to use some of my suggestions, I will list the tutorials in the sources and links section at the end of this article.